It was a dark, wet Thursday evening and I was Rushing Through the SF Ferry Building as my ship had come in to take me home. As I passed the Ferry Plaza Wine Merchant (motto: “We spit so you don’t have to”) I realized I owed the world a sparkling wine review every week until New Year’s Eve 2015. Last week was a home run (Dibon Brut Reserva Cava Penedes, Spain $9.99) so I was brimming with ambition for my next selection. The Ferry Plaza Wine Merchant is one of the anchors in the renown SF Ferry Building. If you visit SF, this stop on the tour is worth the aggravation of parking drama or extra cab fare. 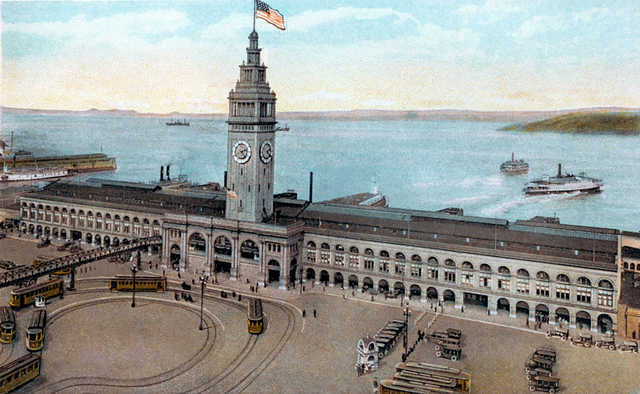 The Ferry Building is best known for the amazing farmer’s markets on Tuesday, Thursday and Saturday. Widely acclaimed for the high quality farm fresh produce and artisanal foods, it is renown as one of the top farmers markets to visit in the country. Saturday mornings especially, you will very likely see some of San Francisco’s best known chefs fondling the watercress, nosing a Chanterelle or ogling the Romanesco. 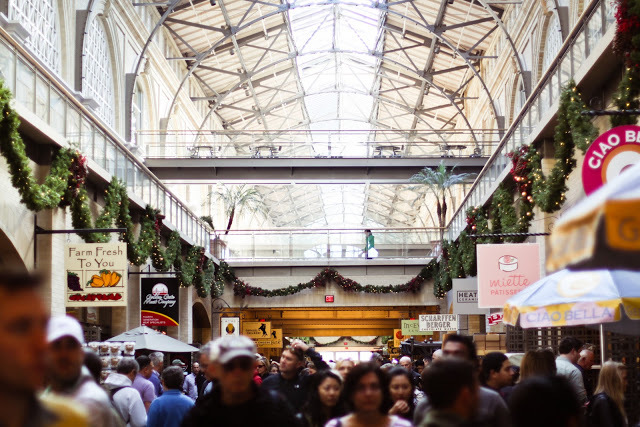 Nearly 25,000 shoppers visit the farmers market each week, but everyday the plaza is home to many highly regarded foodie merchants/innovators including; The Slanted Door, Cowgirl Creamery, Heath Ceramics, Blue Bottle Coffee, Sur La Table, Ferry Plaza Wine Merchant and more, more, more. Inside the SF Ferry Building – Check out La Mia Vita Blog for a great pictorial of the foodie extravaganza! The Ferry Plaza Wine Merchant has a loyal wine membership that begets their robust calendar of events, tastings and pairings. Their mission is to find the most interesting and delicious wines from smaller producers around the world – I’m on board with that. They also have a store located in the über foodie fabulous Oxbow Market in Napa. One of their founders/buyers was honored as “Sommelier of the Year” from the James Beard Foundation and all the partners have impressive bios as wine industry professionals. As I write this, I’m pressure texting a friend to join me for their 6th Annual Champagne and Oyster Fête this Wednesday. Ahoy there! As I ran past all the stalls to catch my ferry, I saw the display of sparkling wines under $20 front and center. How long could this take? Bad judgement? Well, I do tend to push the edges of timeliness and if there is a plane, train or ferry to catch, subconsciously it becomes a game of chicken. My race against the clock felt necessary in this instance. I had wine to drink and a post to write. I was in luck, no lines and the wine merchant was at the ready to provide guidance. I explained that I wanted a sparkling wine under $10. What did he recommend? At first he was puzzled, and expressed that my request was a tough one, could I spend a few more dollars? Sure, why not? Better to take his recommendation than miss my ferry and swim to Alcatraz. I had to abruptly explain that my ferry was leaving in less than ten minutes and the only requirement is that “It can’t be crap.” He handed me a wine, briefly explained the notes and origin, I gave him my credit card, signed, grabbed the receipt, the wine and booked off to my pier. Two minutes to spare, the booze cruise was still there! Hurrah. 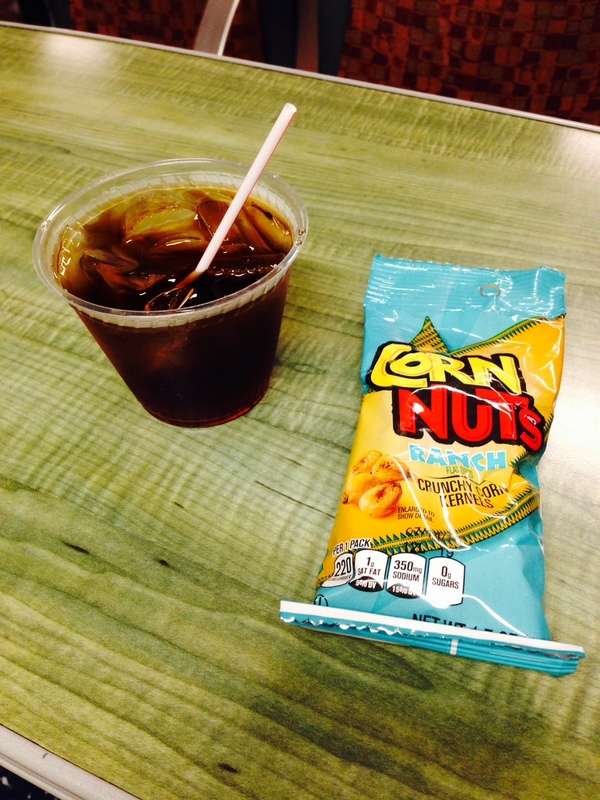 I got on board, went straight to the bar, ordered dinner which consisted of a Captain Morgan and Diet Coke with a side of Ranch Flavored Cornnuts. My compliments to the chef. Those cornnuts are not levitating, they are just happy to see me. Oh, so now where were we? Yes, yes, I was reviewing a wine. After a leisurely 50 minutes on the ferry, I was home. I chilled the bottle in the fridge (45° F.) Before serving, I placed the bottle in the freezer for ten more minutes. I admit, I was concerned that this wine might ruin my night, so I wanted it to be ice cold. Who needs another cranky post. 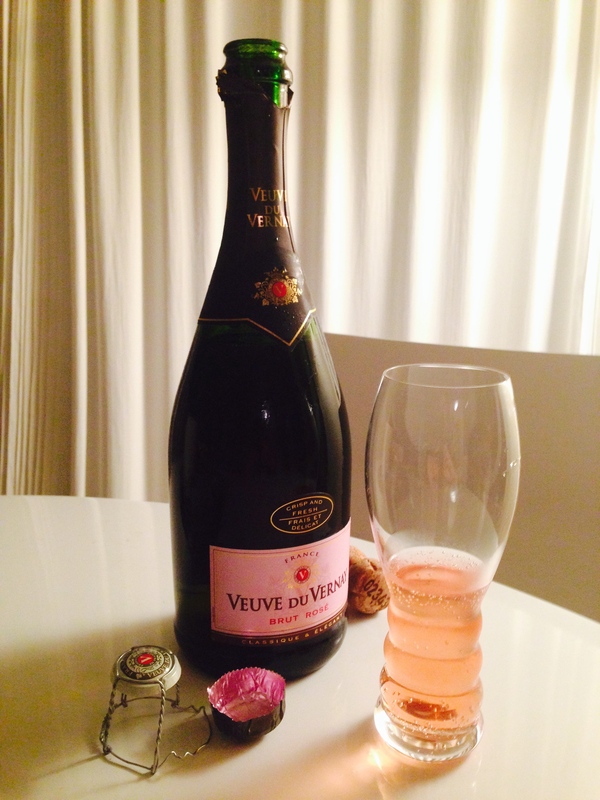 When I finally had the courage to pop the cork, I was happy to see a lovely salmon pink sparkling come to life. The nose was fruity, candy apple. First sip I tasted strawberries, florals and it had a nice balanced acid and flavorful intensity. Even though it was fruit forward, it was not sweet and the finish was long and dry. Mousse was moderate but still rich. As the wine warmed, the flavors nicely became more intense but I also noticed a nutty bitterness, which made me reconsider whether or not I loved this wine. However, the packaging was very pretty. The chocolate brown foil with pink and gold accents was very tasteful and felt luxurious when serving this wine to guests. Billecart-Salmon it was not, but it was very enjoyable cold and exhibited quality beyond other sparkling value wines at its price point. I would buy this again and I would be comfortable bringing this to an event. Surprise and delight! The pink underside of the brown foil impressed me. It does not take much. There was very little on the label to tell me what this wine was about. It was rather mysterious. 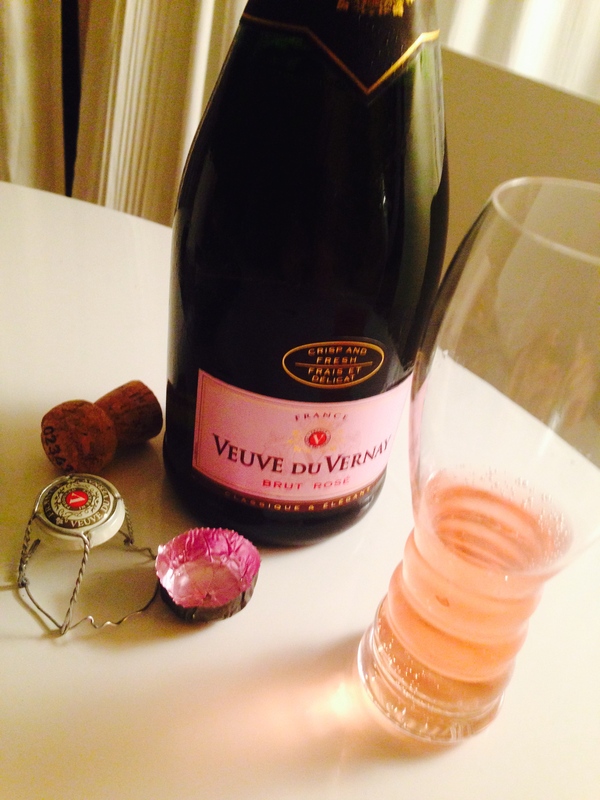 The Veuve du Vernay site specifies this wine as 11% alcohol and a blend of Cinsaut, Grenache and Syrah. This brand was created by Mr.Jean Eugène Charmat, the French scientist, who in 1907 invented the cuve close (“sealed vats”) method of producing fine sparkling wine which has since been adopted worldwide. Most sparkling wines are produced in one of two ways: Method Traditionelle wherein secondary fermentation happens in bottle, or vat fermentation which is eponymously named the Charmat method. What’s with the “Veuve?” Monseiur Charmat had a high regard for a widow (veuve) in the village of Vernay who helped him to start his business. When Eugène Charmat’s son Robert created a new sparkling wine of high quality in the 1960s, he named it in honor of the lady whom his father esteemed so highly. Today Veuve du Vernay is an internationally known brand of value sparkling wines from France that are priced well as a result of Monseiur Charmat’s invention 108 years ago. Let’s raise a glass in honor of the inventor and founder who made it possible for the world to enjoy quality inexpensive sparkling wine today. Down the hatch! ← Serendipity: My #MWWC13 Entry…. It all sounds great. Love all the merchants in the SF Ferry Building!